Total Assurance Home Healthcare is a non-medical home healthcare agency located in Connecticut & New York. We provide in-home health care services and in facility care to patients over 18 years old who are disabled, sick or elderly. We are your trusted source of comfort and care for your loved ones, assuring them the best quality of life at home. Whether they are in recovery, living with a chronic disability, or going through the natural process of aging, the compassionate care our experienced professionals provide will always meet their specific home care needs. After a quick assessment with you and your loved one, we can develop a customized care plan to meet all of their needs. Total Assurance Home Healthcare is composed of loving, courteous, and reliable staff members. 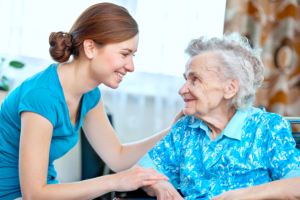 Focused on providing assistive In-Home care services in Connecticut, our skilled professionals and caregivers are solely committed to delivering quality patient care that is difficult to match in the industry. Our network of compassionate caregivers includes sitters, companions, Home Health Aides, Certified Nurse’s Aides, and Licensed Practical Nurses who are prepared to care for you in any way they can. At Total Assurance Home Healthcare, it is our mission to protect the well-being of our patient’s by providing quality home care support and compassionate health care. We are devoted to giving real assurance of care which is essential to our client’s health advancement. Call a Total Assurance Home Healthcare intake center today at 1-877-372-3885 to learn more about us and the services we provide. Our staff members will be happy to address all of your questions and concerns about home care.